Todd from the Big Blog of Gardening recently commented on an article here about Planting Your First Vegetable Garden and took exception to the idea that growing your own is a lot cheaper than store bought produce. Well, I don’t know about the “cheaper” part of growing your own vegetables. Yes, seeds are cheaper, but when you add up all of the organic inputs, I’m sure that each tomato is costing me $64! However, I wouldn’t have it any other way…. I’m sure that Todd was exaggerating when he described those pricey tomatoes that were harvested from the garden, but he may just be on to something; could it actually be possible to grow such an expensive tomato? • Purchase Transplants – Sure transplants are convenient and in the case of tomatoes, probably the best option for the new gardener, but I’ve seen individual seedlings priced as high as $4 to $5 apiece. At that rate you’ll be well on your way towards producing the world’s most expensive tomato! • Got Tomato Cages? – If not, they’re a bit pricey at a few dollars per cage for the flimsy generic models that don’t work very well. Purchase fancier Texas Tomato cages, tomato ladders, spirals, or one of the other deluxe support devices and you can easily spend upwards of $25 per plant just for the supports! 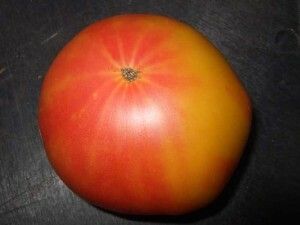 • Gourmet Tomato Food – Yes, you’ll find all sorts of special tomato fertilizers on the market, and I’ll admit that the last thing you want to do is feed your tomato plants a steady diet of high nitrogen fertilizer, but I’m not convinced that they need expensive, gourmet quality food either. • Planting Early – Even if you start your tomatoes from seed you can still enter the running for a $64 tomato by sowing your seeds super early. If you start them during the month of January you can incur additional expenses on heating and electric lighting to pamper the transplants until it’s warm enough to set them out in the garden next May. • Tomato Supplies – Here you’ll encounter everything from tomato irrigation devices, organic pesticides, blossom end rot treatments, seedling trays and containers, bloom sprays, special colored mulches, hydroponic grow systems, and more. Total everything up and that $64 tomato is beginning to look like a bargain! So it looks like it really is possible to grow a $64 tomato… but it’s just as possible to raise a tomato that will cost you pennies compared to what you’ll pay at the local market. And you’ll know exactly how and where it was grown, what was used in its cultivation, and it will taste better than anything on the grocer’s shelves! I’ll admit to using my share of gadgets in the garden, but I also know how to do without the devices and outside inputs if necessary. Last weekend Roger Swain, former host of the Victory Garden program was in town for a garden show and mentioned that one way to judge the success of your vegetable garden is by how little money you spend in it. That’s a great point of view and measuring stick to use in the garden! If your goal is to produce a $64 tomato of your very own, we’ve covered enough ideas to start you well on the way towards reaching it. 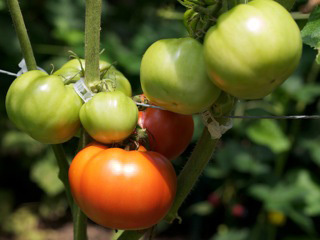 But if you want to cultivate tomatoes and save money in the process, browse the section on raising homegrown tomatoes, watch the video of an inexpensive trellising system, and learn the simple trick to encouraging stockier seedlings. I’ve also written a new eBook that’s designed to help you avoid creating the world’s most expensive vegetable plot. Start your new garden off right by downloading a copy of the “Veggie Gardening Primer” eBook. It’s free when you subscribe to the Gardening Secrets Newsletter, and features a 7-part companion email series of tips for the beginning gardener. You decide… you can raise the next $64 tomato, or you can harvest loads of fresh produce from your backyard relatively easily and inexpensively. And while you’re deciding, feel free to comment below and share the most costly contributions that you have made in the past towards a sixty-four dollar tomato of your very own! I actually read a book called, “The $64 Tomato: How One Man Nearly Lost His Sanity, Spent a Fortune, and Endured an Existential Crisis in the Quest for the Perfect Garden” by William Alexander where he added up the cost of his garden figured out that each tomato cost him $64. Laura, I have seeds left over too and plan on saving my own tomato seeds this summer to help keep costs down and to trade some of my favorite seeds with others. Anthony, thanks for sharing the info on the $64 Tomato book by William Alexander, I had never heard of it before now and I did add the Amazon link to your comment if anyone is interested in it. Here’s my review of the $64 tomato, which I just happened to read in the last few weeks. Creating your own Compost, saving seeds, etc. I marvel at how folks go out of their way to discourage people from growing their own food. Between saving my seeds, and trading with others, I haven’t purchased for myself for a long time. You should wait until it stays above freezing. Tomatoes can’t handle frost. Ideally, tomatoes prefer nights above 50 degrees F.
Thanks for this insight! I busted up the ground this afternoon for my very first garden, and at some point it occurred to me that my costs might far exceed what I would spend at the Farmers Market if I left the gardening to the pros. So, I planned to give myself “credit” for self-satisfaction and the value of the exercise, time outdoors & vitamin D!! I found your site when looking for suggestions for small gardens. Unless I go dig some more, mine is only 8’x11′ with a 6′ fence on 2 sides. I will enjoy getting well-acquainted with your site as I await planting season! Hi Kielfergen, I agree with Laura, you are better off waiting until after the weather has settled and the soil has warmed up before setting out your tomato plants. Some gardeners rush things but then the young seedlings may need additional protection and you run the risk of the plants being stunted by frost or cold temps. Good post! I have already been looking for a very good website with regards to Gardener around and also in english and lastly discovered! Keep doing the job, you’re going very well. I throw the seeds in the ground stick some sturdy sticks next to the seedlings and tie them up with some bread ties I save from bread. I do water them if it gets too dry out and I will admit to a once a year non organic love of miracle grow but overall I refuse to pamper tomatoes lol. I always end up begging friends to take tomatoes. Oh and I really don’t even have to plants seeds any more I get all sorts of volunteer tomatoes every spring! Grandpa babies his tomatoes and he never hardly gets any from them. < I am a no-till/orchard farmer which is best for the soil. Just dig a hole and stick the tomato (or other plant) in. Water freely. Transplants may wilt a bit on the first day but if well watered they will perk up and thrive. < Now, I plant about ten plants a year. This feeds my extended family and leaves plenty to sell at our local farmers market. This practice makes my tomatoes cost fractions of pennies each which is off-set by the ones sold. Dumb question? Is there anyway to grow tomatoes indoors? City living is taking its toll on me! That is my favorite book The $64 Tomato funniest book I’ve ever read.